YEH INDIA KA CRICKET HAI -PART II :JITTERY DRIVES,NERVY HOOKS & BLIND REDEMPTION ! The India Australia Test Series is underway and the Indian Team is straining all its sinews – not to meet competition- but to go Down Under! With the Indian galley holed and sunk twice already only the committed few have survived scrutiny. For the others, there’s no Anushka Sharma this time around, to play scape goat for their “jittery drives” and “nervy hooks”! The contest for the Border Gavaskar Trophy is always a much anticipated affair. It’s billed higher than the England Australia Ashes too and more so this time as the current series is being played under the emotionally charged backdrop of the tragic demise of Aussie cricketer Phillip Hughes. So far the Mahendra Singh Dhoni and Virat Kohli led Indians have faltered miserably. Yes! We have two Captains, so what? We have the richest and most powerful cricket set up – BCCI – and we can do anything! Why, we can even add a third Captain after all its an important series, isn’t it? And I recommend Team Director Ravi Shastri as Captain No 3. One for each session of play.The Aussies will probably be too busy laughing and might lose half a Test Match !!!! In the first “Test” at Adeaide,India lost narrowly by 48 runs largely on the back of stand in Captain ,Virat Kohli’s “tons” (centuries – 100 runs)in each innings. Making his debut as Captain, Kohli led from the front and bravely too, especially after being hit on the head off the very first ball he faced. At this stage it seemed as if the “no WAGs on tour” ( WAGs – Wives and Girlfriends) theory had some merit indeed. So,I waited for the results of the Second India Australia Test Match at Brisbane to see if the controversial “no WAGs” assertion got established for good.or would come undone. India batted well in the first innings and it seemed that the absence of WAGs was doing them good. But the second innings saw a woeful batting display.Shikhar Dhawan’s freakish wrist injury during practice on the fourth morning of the second Test Match meant that Kohli would have to go in instead at the start of the day’s play. The switch didn’t work and the Indian batting collapsed. The Captain said that Kohli got just 10 minutes to prepare for the switch in batting order and the change “unsettled” the team! Did I hear it correctly? The change in batting order “unsettled” the team??? (And not the presence of a WAG – MIND IT ! )Also,Kohli failing in both innings implies that after all its not Anushka Sharma but his batting prowess which holds his game together or otherwise. And by the way, professionals don’t proffer such lame excuses and are supposed to be conditioned and always prepared for the worst just as doctors and Army personnel are. Highly paid and pampered – our cricketers blaming the practice pitches, lack of time for preparation or lack of vegetarian food for their dismal performance smacks of a fortress and under siege mentality. Just admit that Mitchel Johnson was too good on the day. With this attitude I predict a 4-0 score line in favour of Australia..
Now that the “no WAGs” theory is all but consigned to the dustbin, what if some team member insists on rechristening WAGs as BAGs? BAGs ? Boyfriends and Girlfriends! Prepare for it now, lest we find ourselves as unprepared as our “dhoorander” (or down under) cricket team. The Amul ad/ topical on Virat Kohli commemorates his remarkable achievement of scoring a century in each innings of an overseas Test Match.It has a caricature depicting the bearded Virat holding a placard in each hand announcing his feat.The Amul Girl is holding the player’s cricket gear and offering him a Amul butter laden toast as a reward for his achievement. The Tag Line…Vir Proud of You…is a play on the name Virat and the words “we are” and expresses the sense of pride in the manner in which the “Captain Braveheart” compiled the centuries , in the first Test Match in Adeaide, in spite of getting hit by a bouncer as well as inspired an epic, though unsuccessful, run chase. The Punch Line…Tons of Taste…alludes to the two “tons” – 100 run scores- copiled by Kohli as well as extolls the superlative taste of the Amul Butter. And the WAGs have struck back too, as not taking them along on tour has denied our team management valuable options,as some of the WAGs would surely have batted better than the Indian “tail” which has refused to wag so far and has firmly stayed between the hind legs! Curse of the WAGs, any takers? The Indian cricket team may not win redemption Down Under but it did happen in some measure through the astounding feat of India’s Blind Cricket Team. They beat arch rivals Pakistan in the fourth World Cup recently held in South Africa. These are “bravehearts” too, who deserve accolades galore.The media chose to relegate the achievement to an almost “non-issue” status and though the Team was felicitated by PM, Narendra Modi there wasn’t any accompanying euphoria or ticker tape parade either. They have equaled the feat of the able bodies cricket teams of 1983,2007 and 2011 but for our lack of regard for the specially abled, their achievement has gone unsung. None-the-less, these brave blind men have won our cricketing heritage a redemption of sorts. 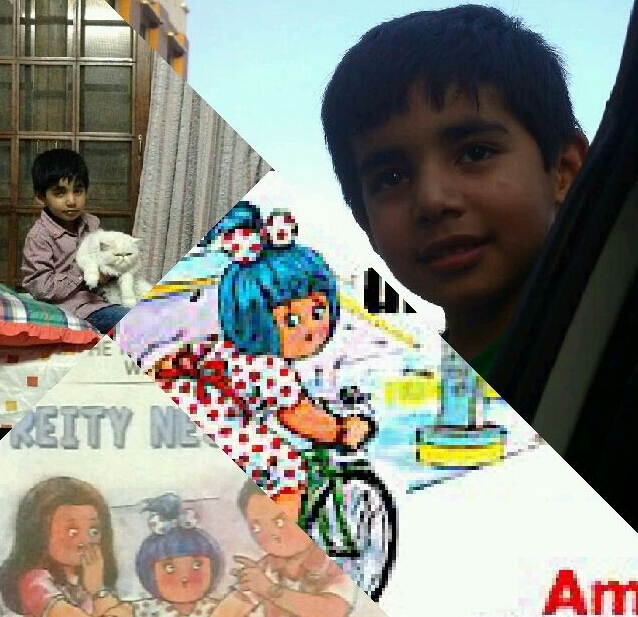 The Amul ad line also paid tributes to Aussie cricketer Phillip Hughes (also known as Phil Hughes) who died as a result of a bouncer hitting him on the back of his neck.He died 3 days short of his 26th birthday and was also on the cusp of his recall to the Aussie Test Team.His accident and demise provoked a huge outpouring of grief in Australia and amongst cricket players and enthusiasts.The incident also sparked a debate on the safety gear in cricket as well as whether the “bouncer” needs to be banned or not. 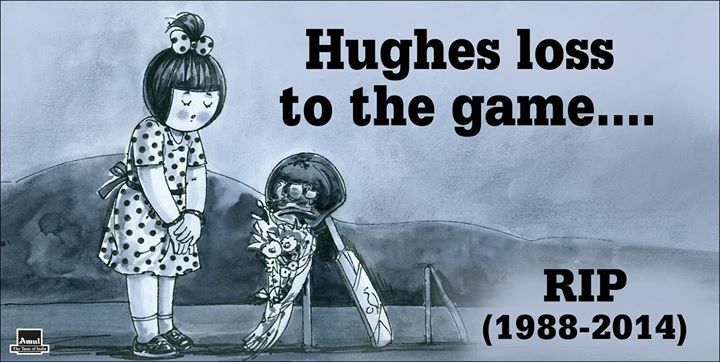 This Amul ad/ topical on Phil Hughes pays tribute to his memory and cricketing persona and has captured the “#PutOutYourBats” campaign and form of tribute adopted by millions of people worldwide when they “put out their bats” with a cap in remembrance of the fallen cricketer. A huge loss indeed. RIP “HUGHESY” -1988 – 2014 ! 23 December 14; On the eve of the Boxing Day India Australia Test Match it has emerged that after Virat Kohli got out cheaply on the 4th day of the second Test Match at Brisbane , he came and lambasted Shikhar Dawan for “feigning” injury to avoid facing the Aussie pacers.To which Dhawan retorted sharply leading to Team Director Ravi Shastri intervening and preventing the situation from going out of hand. “Virat Kohli Shikhar Dhawan Fight” ! I typed this to get in on the details myself.Happy surfing !!! Virat Kohli’s disappointing performance in the knock out games in the World Cup came in for critical review as it seemed that young firebrand and the Indian Test Captain , for all his imperious talent had yet to learn how to handle the pressures and weight of expectations of being a frontline Indian cricket player, especially in big ticket games.He is being touted as the next Tendulkar, but he has a long long long way to go before he can emulate the maestro.Its not about the cricket scores alone, its also about the temperament and the ability to soak pressure, which Tendulkar did admirably for 25 years and stayed at the top of his game dishing out one memorable performance after another. The adoring millions turned against Virat Kohli ,as they sought to vent their ire and lay the blame for the loss of their team at the World Cup.The presence of his girlfriend , Bollywood actor, Anushka Sharma, with him during the World Cup once again coincided with his poor form and led to blame being laid on her for Virat’s performance.Her presence was considered as the reason for Kohli losing his focus and concentration.Lots of netizens ripped into the duo and anequal number lent them support as well.Kohli and Sharma exited the airport, on arrival in India, holding hands and looing distraught and uncertain and clearly seeking solace and comfort in each other. This Amul ad/ topical on Virat Kohli and Anushka Sharma captures the criticism that the duo faced for Kohli’s poor performances with the bat.It shows two caricatures, depicting Virat and Anushka sitting togethr and tending to each other, with the Amul Girl offering them the delicious Amul butter laced toasts.The topical captures the cricket player’s and the Bollywood actor’s romance especially in the backdrop of the negative publiciy that the duo received. The Tag Line …Sab ne bana di jodi… is a play on the Anushka starrer Rabb ne bana di jodi and hints at the Virat and her being a couple. The Punch Line …Have It NHow… is a play on the word “now” with the first two letters in the word “NHow” ,subtly reminding us of Anushka’s home production NH 10, in which she also stars in the lead role. This is not the end of the story.There’s much more and i am sure they will be happy tidings to say the least. Previous PostNIRBHAYA REDUX – “UBER” DISGRACE & THE THEATRE OF THE ABSURD!! !Next Post“FREEZER “, “KISSING” & “TUNNU” BABAS – GODMEN GALORE AND THEIR TEMPLES OF DOOM ! Great read….agree with each word and sentiment of the article. I loved the coinage of BAG; and I agree we need to be prepared for it..less we look for excuses like Dhoni made. 4:0 it seems is a safe prediction, as an Indian cricket fan what we need to do is burn the cricket gear of these multi millionaire cricketers and start our own Indian Ashes series with all countries we get white washed. Believe in live and let live and that lets not find crutches for our shortcomings, rather make amends and strive for a better tomorrow.